I have to say, I don’t usually think of strip malls as having great gourmet food, but more and more, I’m finding that to be the case. There is a great little place called Pita Cafe in Rohnert Park. It’s about an hour and a quarter north of San Francisco right off Highway 101. Pita Cafe looks rather ordinary, sandwiched between a Baskin Robbins and some non-descript Ralph-ertson’s-way supermarket. Mediterranean food, in the US tends to have a lot of vegetarian items, but it’s interesting to see how each establishment interprets that. We’ve been to Pita Cafe a few times, but always order the same things. They are just so good, why stray to other items? 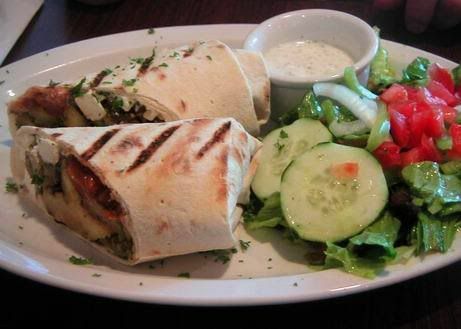 My favorite is the eggplant wrap with grilled eggplant and tomatoes, parsley, and garlic spread. The wrap is lavash bread, which is kind of a cross between pita bread and a flour tortilla. It comes with a flavorful tart cucumber sauce (tzatziki), and you can add feta and either fries or salad on the side. The briny tang of the feta is a must, with the roasted richness of the eggplant. It’s one of those messy, dripping down your hands kind of wraps. The other dish that is a close second in my book, is the vegetarian Mediterranean Meza plate. 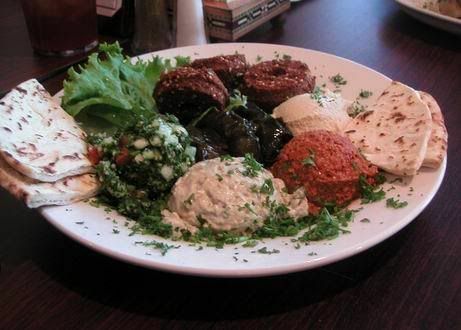 It comes with 3 falafel patties, hummus, tabouleh, baba ghannouj, 3 dolmas, muhammara and pita. They are small portions that taste great by themselves or in combination. The falafel is a spiced garbanzo batter that is fried with a nice hearty meatiness. Hummus is a delicious garbanzo dip with garlic and lemon, which I usually love, but is not seasoned quite as well at Pita Cafe. Tabouleh is a light salad with lots of bright parsley, usually bulgar wheat, and lemon. Baba ghannouj is a creamy roasted eggplant dip with garlic and sesame tahini. Dolmas are little stuffed grape leafs with rice and spices which have always been one of my favorites. Meat ones are usually served hot, while vegetarian ones are cold. Muhammara is a dish I had never encountered until Pita Cafe. It’s a dip made from walnuts, roasted red peppers, garlic and olive oil. To use an overused term, muhammara has a synergistic quality of being more than the sum of it’s parts. It’s so yummy, but a little difficult to tell exactly what’s in it. Here is a tasty looking recipe for it from Epicurious. I’ll have to make it sometime, and I’ll let ya know if I do. Their food is quite delicious, and they do have meat dishes as well. Can’t speak to those, sorry. They also have very unique and tasty desserts with ingredients like filo dough, rose water, coconut flakes, pistachios… yum. Their hours are a little funny since they don’t stay open past 8 or 9pm, but if you get their early enough, you are in for a treat. 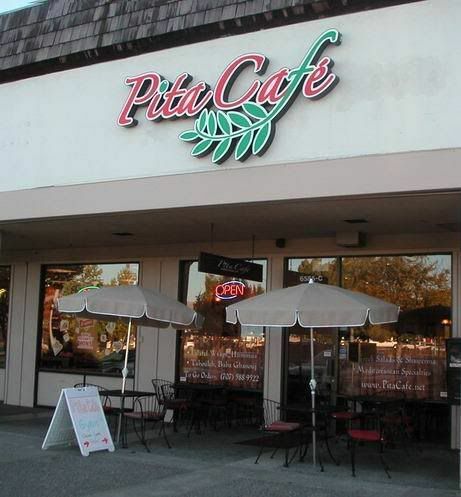 Pita Cafe is located in the North Bay Center in Rohnert Park at the corner of Rohnert Park Expressway and Commerce Blvd. The food at Pita Cafe is ALWAYS outstaniding…….it is an amazing little restaurant, complete with linen table clothes and sidewalk tables. I’m a vegetarian, my husband isn’t……..and we both have lots of tasty choices. We HIGHLY recommend Pita Cafe!! Thanks for your comment Barbara. It really is a great little restaurant and everyone should know about it so they stay in business. Glad you’ve discovered it as well.